Rest in peace, Mr. Rickman. So many of your performances on stage and screen were wonderful, but my favorite role of yours was Colonel Brandon is Emma Thompson's Sense and Sensibility. My single favorite line from that movie--indeed, from any Austen adaption I've ever seen--was when Brandon revealed his sad past to Elinor. 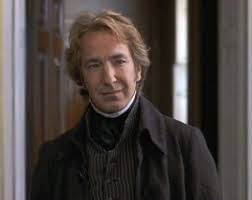 Mr. Rickman, you drew more sadness and wry wisdom out of this short scene--indeed, from those two words, twice spoken, more humor--than I think any equally skilled stage and film actor ever could. I can't find an embed, but we can watch it here. Look up Mr. Bowie, and have a fine drink with him, will you? Godspeed. Jacob Levy's Rationalism, Pluralism, and Freedom is a superb work of political theory and intellectual history. 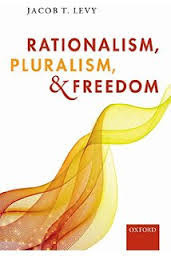 It introduces, in clear and compelling language, a new way of making sense of the development of liberal ideas, by distinguishing between what he labels "rationalist" (consistent, transparent, state-centric) and "pluralist" (variable, private, culture-dependent) responses to the threats to individual freedom which have arisen throughout the history of liberalism. And then, as an encore, he uses all that his analysis has suggested to shed some new light on contemporary theoretical debates. Overall it's a great book, one that I hope will have a long life. What is there to criticize? Not much. I'm sure defenders of the rationalist approach to ensuring personal liberty (Jacob makes clear his own preference for the pluralist approach) might take issue with some implications of how he sets up and describes these variations within liberalism. And fans of Charles Taylor (like me) might think that Jacob’s suggestion in the conclusion that Taylor’s history of modernity wrongly attempts a synthesis of rationalism and pluralism is a simplistic reading of Taylor's philosophical aims. But all that is rather small potatoes, especially considering that such nits arise in the beginning and ending of the book, and skip over its central, and best, section, which deals with the history of intermediate groups in the West and their relationship to liberalism. For myself, the most interesting way to engage that section is through Jacob’s (too short!) treatment of the rise of towns, cities, and provinces, and how seeing those bodies as associational forms presents different types of pluralist challenges to our understanding of how best to define and defend individual freedom. He begins by asserting--relying here primarily upon the scholarship of Harold Berman--that cities and towns are essentially non-contractual entities. Rather than emerging through some hypothetical social contract or actual historical process of constitutionalization, they are bodies of individuals that ratified their own collective existence in particular places (along rivers or trade routes or mountain passes) through “real acts of mutual promise” (p. 96): in other words, through the organic realization of, the participatory recognition of, a community. This distinguishes them, when one speaks of local governing bodies, from counties or provinces, which usually were “geographically far larger than cities...not surrounded by a wall...primarily rural...certainly not founded by equals committing to one another by oaths...[but rather were] in large part the leftover geography of the processes of state consolidation” (p. 108). Jacob’s tracing of the different forms and norms of law which emerged as relevant to these different types of local bodies–Germanic or “gothic,” in the first case; Roman or republican in the second–opens up multiple lines of argument within political theory. For example, his idea that the “Germanic legal model of law [was] tied to personal status” is only truly effective in “mostly homogenous” contexts, whereas something different was needed for “the arms’-length interactions of strangers engaged in long-distance or urban trade” (p. 101), parallels the arguments of the sociologist Lyn Lofland, who in A World of Strangers contrasted the pre-industrial city, whose inhabitants informally ordered themselves through signs of personal recognition (what someone was wearing, for example), with the industrial, commercial city, where that informal order was provided by recognizing the--often authoritatively determined and imposed--rules of one’s location (the part of the city where one lived or worked). There is also the sense in which these distinctions can deepen our understanding of the intense connection many throughout American history have made between freedom and independent ownership, and the socio-economic and spatial context (urban vs. provincial/rural) relevant to the intensity, or lack of such, felt for that connection. Jacob observes that “the paradigmatic city for the humanists and republicans was a sovereign city-state, maybe sitting at the head of its own empire [though a limited one, presumably]...the independence of the city was a prerequisite to the freedom of its citizens. The Germanic tradition that Stadtluft macht frei [“city air makes one free”] rested on no such assumption” (p. 133). Seeing these bodies as part of ongoing arguments over association freedom, lends important light to ongoing arguments about how public policies ought to be constructed, on the one hand, in regards to the tangles of political and economic obligations and opportunities which so often characterize modern capitalist urban life, as well as towards the (more often idealized than real) clear rules and spatial authority supposedly associated with private property ownership on the other. That is light which Jacob himself is, perhaps, not entirely aware of. Jacob is to be credited with having been among those political theorists who recognized early on the great value of James Scott's arguments about state and market-based forms of rational, organizational oppression, but he's been ambivalent about accepting Scott's insistence that it is the modernist logics of the market and the state which push this oppression, not something that only happens when the latter appropriates the former. Some of this reluctance might be discerned by looking at what is not particularly discussed early in the book, when Jacob writes about the value of "associations that resist the state" and explores Adam Smith's warning about the "man of system," without making any comment about, say, the rational reformer who wishes to get rid of inconsistent trade barriers and idiosyncratic excise and sin taxes, all in the name of maximizing the benefits of creative destruction (pp. 59, 67). But is important that we make use of the light Jacob has provided in his book exactly in regards to these matters. .
Why? Because, as Jacob superbly demonstrates in his brief history of the Western political understand of cities, these bodies are often much more than--using Oakeshottian terms--civil associations, but rather are enterprise ones, complex and purposive bodies which offer "local and distinct lifestyles to mobile populations, letting people sort into local communities, whose distinctiveness then becomes reinforcing" (p. 289). In connecting this observation to his larger analysis of liberalism, Levy gives added theoretical heft to arguments--made by Jane Jacobs, Richard Sennett, and many others (including me)--about the anarchic-yet-ordered potential of economically sufficient cities. While one can certainly fill whole books with accounts of localities throughout history being threatened by state-mandated "rationalizing" projects, in the name of ethnic cleansing, ideological punishment, or political homogeneity, surely one needs to at least acknowledge that in the modern and (mostly) law-abiding Western societies of today, the greatest threat to the survival of the purposive, economically sufficient, culture-forming capacity of cities is, in fact, the dominance of global finance capitalism. A dominance which is, of course, abetted by economic elites: elites whose propertied position and business revenue tends, more often than not, to be situated in provincial, state, or international contexts, rather than in the local urban communities they are part of; elites who, consciously or not, consistently favor making their lived environments as amenable to those remunerative, globalizing processes as possible. Note that I acknowledge the remunerative character of these processes. There is no denying that there is a strict utilitarian, economic argument for the individual empowerment which generally arises from the capitalist rationalization of cities, making those bodies, and the consumers and workers who live there, into, as much as possible, enriching nodes in the global finance and capital flow machine. The question is: is liberty always best served by the liberation of individuals from obligation, community, and want which specialization and efficiency often (though not always) provides? Jacob's own preference for pluralism suggests that, despite his own libertarianism, the answer may not be a clear "yes." Still, his overarching thesis is that there can be no resolution of the rationalist-pluralist divide in liberalism, nor any moral judgment as to objective superiority of one over the other, so he really doesn't answer this question--indeed, he doesn't even broach it in these terms. But he shines a new light upon the question nonetheless, and that is valuable enough. In the end, the great accomplishment of this wonderful book is that it provides a language to help us see (for many of us, for the first time), and thus think productively about, the history and significance of the rationalist-pluralist divide in liberalism. If Jacob himself didn't use that language to address, say, city-county relations, or local versus global markets--well, that's a small loss, but not a great one. Because he's now shown us all a better way to go about doing exactly that on our own. Freedom indeed! "I Thought He Had One More Regeneration Left in Him"
David Bowie was the Picasso of pop. He was an innovative, visionary, restless artist: the ultimate ever-changing postmodernist. 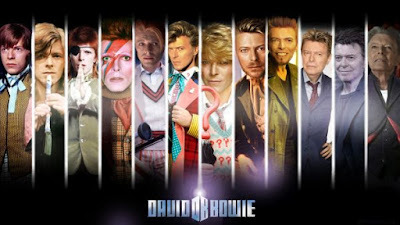 Along with the Beatles, Stones and Elvis Presley, Bowie defined what pop music could and should be. He brought art to the pop party, infusing his music and performances with the avant-garde ideas of Merce Cunningham, John Cage and Andy Warhol. He was a great singer, songwriter, performer, actor, producer and collaborator. 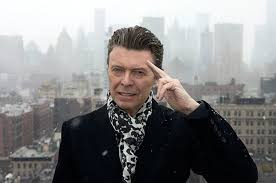 But beyond all that, at the very heart of the matter, David Bowie was quite simply--quite extraordinarily--cool. Here, in memoriam, are five slices of the man that come to my mind this morning.